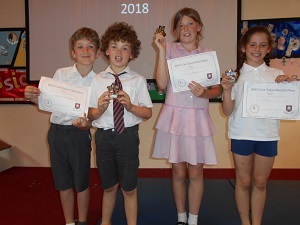 Bishop Winnington-Ingram Primary School held their Talent Show in the school hall on Wednesday, July 18th. 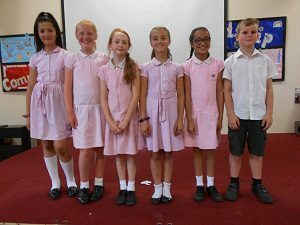 The show was very professionally organised by six Year 5 pupils, Charlotte, Diana, Lilly, Miles (who was responsible for music), Millie and Victoria. They introduced each contestant and followed each performance with encouraging comments. They had also produced excellent mark sheets for the judges with marks to be awarded for Confidence and or Presentation, Voice Projection or Creativity and Crowd Appeal. There were ten contestants whose performances included comedy, break dancing, singing, gymnastics and dancing. Half way through the acts the pupils were entertained by Mrs D Stanbridge, who joined by her daughter Annabelle, sang Stand by Me and You Alone. To the delight of the audience, they were invited to join in with the chorus. All the contestants’ performances were very entertaining which made the job of the judges a difficult one. However, after deliberation they decided on the three finalists who were each presented with a trophy and certificate. Bronze Winners were Nathan and Rhys for their very funny act Comedy Men. Silver Winner was Emilia for her fantastic gymnastic & dance routine. Gold Winner was Bethany who gave a stunning vocal performance of What About Us.